The White House has accused Russia of breaking its obligations under the Intermediate-Range Nuclear Forces Treaty (INF), and has announced plans to station ballistic missiles in Europe unless Moscow adheres to the conditions of the treaty. Would Russia really risk jeopardizing the INF, and what are the dangers of restoring its intermediate missile capabilities? The Obama administration is developing plans to deploy winged and ballistic land-based missiles in Europe if Russia does not follow the conditions stipulated in the Treaty on the Elimination of Intermediate-Range and Shorter-Range Missiles, or the Intermediate-Range Nuclear Forces Treaty (INF). Such announcements, reported by western news agencies, have not only generated a wave of interest in the almost 30-year-old treaty, but also provoked a response from the Russian government. Even though it was a landmark agreement in the times of the Cold War, the status of the INF decreased significantly after the end of the confrontation. Today it is difficult to imagine Europe as a direct arena for a military conflict between Russia and the U.S., even in the context of the events in Ukraine. At the same time, the INF, an agreement made between only two sides, does not limit other countries from developing intermediate and shorter-range missile systems. Both Moscow and Washington admit that the mutual need to eliminate intermediate and small-range missile systems is decreasing day by day, especially for Russia. Similar technologies are being actively developed by Russia's immediate neighbors: China, Iran, North Korea. Several years ago there was a vibrant discussion on whether the INF really corresponds to Russia's needs in the modern world. Russia even made unequivocal comments about the possibility of abandoning the treaty. However, in the last few years it is the U.S. that has been creating the information hype about the INF. At the end of 2013 the American mass media reported on suspicions in Washington that Russia was violating the terms of the agreement. The INF Treaty, signed in 1987, foresaw the elimination of missiles with a strike radius from 500 to 5,500 kilometers. The document was a landmark at a time when Europe was viewed as the theater for a potential conflict between the U.S. and the USSR. With their short flight time, these missiles could have had a decisive influence on the course of combat. They had a very important objective: destroying troop control systems. The decision to eliminate this type of armament not only reduced the degree of confrontation in Europe but also laid the foundation for the reduction of the region's conventional weapons. The details of the Americans' claims are unknown. Experts believe that they concern two potential forms of Russia's missile systems: the Rubezh RS-26 ballistic missile and the R-500 winged missile. The Rubezh is formally not affected by the treaty since its maximum distance exceeds the upper limit stipulated in the INF. However, the specifics of the trial program (the missile was successfully tested at a distance of less than 5,500 kilometers) create the impression that the main objective of the missile is to hit intermediate-range targets. While with the R-500 there are doubts about its maximum distance, there are grounds to believe that it exceeds the lower limit of 500 kilometers stipulated in the INF. Russian officials have always been prompt to respond to any of Washington's accusations regarding alleged violations of the INF. The current situation is no exception: Russian Foreign Minister Sergei Lavrov has reproached the Americans for having no evidence to back up their claims. The fact that Washington has still not presented any convincing evidence would indicate that the U.S. does not have the telemetric data necessary to prove its accusations. Nevertheless, Russia must understand that any attempt to restore the category of intermediate and small-range missiles, even by formally following the conditions of the INF, means playing with fire. Despite the fact that the agreement's validity is not limited by any date, Article 15 allows the parties to abandon it if the treaty begins to threaten their "higher interests." Any attempt by Russia to restore its intermediate or small-range missiles, even if they correspond to INF regulations, will trigger various responses from the U.S., among which will be the abandonment of the treaty. The end of the INF would first and foremost have an impact on Russia's security. In such a scenario the U.S. would gain the opportunity to return its intermediate and shorter-range missiles to Europe. 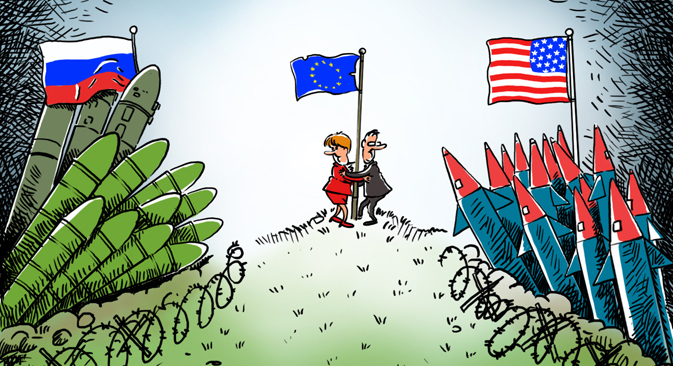 Theoretically, Washington could deploy them not only in Western European countries, as it did during the Cold War, but also on the territories of the new NATO members in Eastern Europe (such as the Baltic states and Poland – RBTH). These actions would reduce the missiles' flight time to Russian strategic targets to several minutes, creating the potential for a disarming strike. Moscow does not have the resources for an adequate response to these challenges and would therefore have to spend a lot of strength and funds on the creation of a system that could counter this potential. At the same time, such a spiral of tension is difficult to imagine even with the paucity of today's Russian-American relations. It is very likely that Washington is just trying to lure Moscow into a discussion through "disarmament" channels, which have always been distinguished by high levels of trust. In any case, today the fate of the INF depends first of all on whether or not Russia has decided to restore the category of missiles that were eliminated by the treaty. If this decision has been made, the U.S., after obtaining substantial proof, will abandon the agreement. If not, then the attempt to establish trusting relations in the field of armament control through dialogue proves that the U.S. indeed wishes to restore normal ties with Russia. Alexander Chekov is a lecturer at the International Relations and Russian Foreign Policy Department at the Moscow State Institute of International Relations and analyst at the Foreign Policy Agency.